Here's to Dropping the Ball! For many of us, 2009 was a helluva year. You took everything in stride, though, and in towering stilettos and pumped up platforms, at that. More than likely, New Years Eve and New Years Day have melded into one for you. It's also highly likely that you brought in 2010 wearing a pair of festive shoes that encapsulates the nights vibe, like these Bruno Frissoni beaded sandals. With their towering gold triple platform and vertiginous heels, you'll have a bird's eye view of all the night's action. The added bonus of the platform is the added comfort you need to dance and strut the night away. Then there's the HUGE ribbon bow at the ankle, which has all the pomp & circumstance that "Auld Lang Syne" deserves. Oh, and don't the accent beads remind you of champagne bubbles? The cool thing is that these work for those located in sandal-friendly locales AND for those who must don opaque tights (for an extra dose of fun, wear a brightly colored pair with your LBD). Since New Year's Eve/ Day have basically blended into one long party, you have two options when it comes to drinking. You can swill something weak (which you will probably guzzle quickly because it tastes so good and get drunk more rapidly than you realize) or opt for something that tastes a bit stronger (and thereby forces you to sip more slowly. Either way, make sure it contains a bit of bubbly. 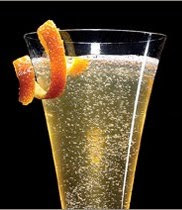 Our vote goes to the "French 75" (recipe & image courtesy of Chow.com). Made with sugar, orange bitters, Bulldog Gin (or Clear Creek Brandy*) and chilled Argyle Sparkling Wine, it's fizzy and effervescent. Yet it's got a strong kick, regardless of whether yours is made with brandy or gin (StyleScrybe prefers brandy). Remember to drink responsibly, though, and to have a designated driver. Otherwise YOU may be the acquaintance who should be "forgot." *Note: Named for a piece of WWI artillery, the French 75 was originally made with gin until it later became more popular to use brandy.